Tony Atkinson and Salvatore Morelli have combine to produce an intriguing "Chartbook of Economic Inequality." The main feature of the chartbook is a set of figures showing long-run trends in inequality as measured by a variety of statistics for 25 different countries, with all the statistics appearing on a single chart for each country. The charts appears in two forms: there's a colorful online version, and then a black-and-white version that can be printed out from a PDF file. The 25 countries are partly determined by the availability of long-run (meaning a good chunk of the 20th century) data. Along with the United States, the other countries are Argentina, Brazil, Australia, Canada, Finland, France, Germany, Iceland, India, Indonesia, Italy, Japan, Malaysia, Mauritius, Netherlands, New Zealand, Norway, Portugal, Singapore, South Africa, Spain, Sweden, Switzerland, and the United Kingdom. The figure for each country is also followed by a few bulletpoints that highlight some main trends. Detailed sources for the data are also provided. Any single economic statistic is a one-dimensional slice of reality. When you put a lot of economic statistics together, and let your eye move from one to another, you develop a better overall perspective. As one example, here's the chart for the United States. But if you have an interest in these topics, I encourage you to surf the countries of the Chartbook. "the top decile of earnings has risen from 150 per cent of median in 1950 to 244 per cent in 2012." The table also suggests some puzzles. 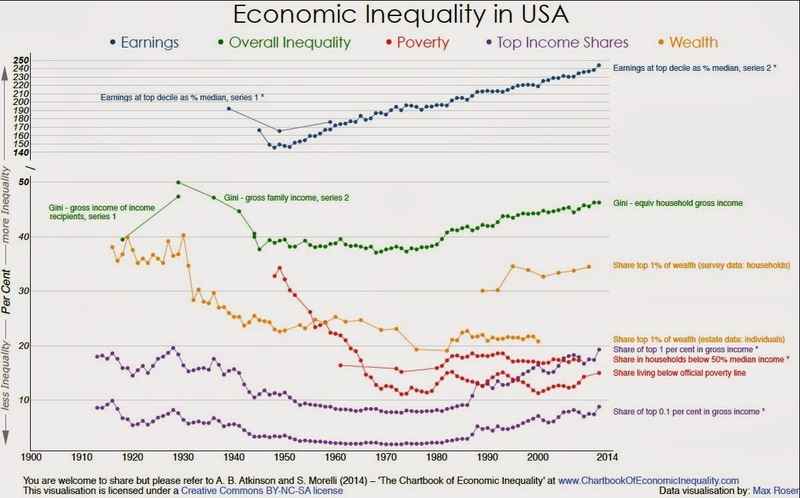 For example, the share of total wealth held by the top 1%, based on estate data, doesn't seem to have risen in the last few decades along with inequality of incomes. The dispersion of earnings as measured by the top decile starts rising in the 1950s, but the overall inequality of earnings doesn't seem to start rising until the 1970s--presumably because during the 1950s and 1960s, there was declining inequality at the bottom of the income distribution, as seen in the falling poverty rate, to offset rising dispersion of incomes at the top. Hat tip: I was alerted to the "Chartbook" by a post from Larry Willmore at his "Thought du Jour" blog.